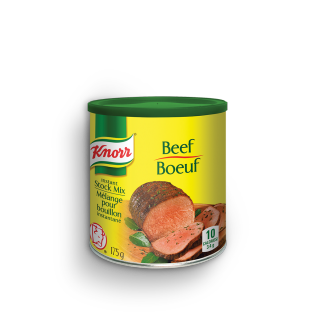 Knorr Beef Instant Stock Mix adds great flavour to your cooking with the rich flavours of beef stock, onions, carrots, parsley and spices. Knorr instant stock mix is easy to use, quick to dissolve and adds rich deep flavour to your soups, stews, sauces, gravies and risottos. May also be used as a delicious hot drink or broth. Salt, corn syrup solids, hydrolyzed soy/corn/wheat protein, monosodium glutamate, yeast extract, canola oil, onion powder, beef extract, maltodextrin, tricalcium phosphate, colour, spices, disodium guanylate, disodium inosinate, citric acid, flavour, and sulphites. May contain traces of milk ingredients. Dissolve one slightly rounded teaspoon into each cup (250 mL) of boiling water.